Modern English designed and developed an online campaign for the Foo Fighter’s Glastonbury headlining announcement that achieved more than 20 million engagements in total. 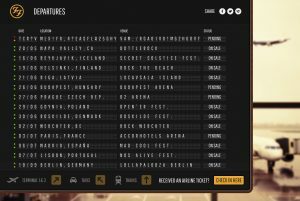 The band’s website homepage was replaced with a ticking airline departures board hinting at a missing flight, creating a whirr of speculation on the internet. Modern English created the website takeover which allowed selected fans who received fake airline boarding passes in the post to ‘check in’. They were then informed via post that that they had been invited to an up-close-and-personal Foo Fighters gig in Frome, Somerset. As the week progressed, the site changed focus several times keeping fans on their toes with a countdown clock appearing telling them to come back to view the ‘inflight entertainment’ - a live stream of the Foo’s gig recording at the Cheese & Grain concert in Frome, Somerset. Over the course of six days, the site amassed more than 1.1 million page views and also featured Modern English’s proprietary super-shareable platform allowing fans and publishers to embed the entire site in their feeds. Website assets were also used across the multiple Foo Fighter’s social channels to tease and promote the mystery as it unfolded. The site is still being used to promote the upcoming summer festival tour with more dates being added and a video of the departures board announcing the Glastonbury slot on the Foo Fighters Facebook page currently has 436k views. In total, there have been more than 20 million engagements online via the website, YouTube, Facebook and Twitter. Co-founder Bruce Thomas said: “The music industry has always been at the forefront of exploiting digital, both technically and creatively, and this new relationship with the Foo Fighters gives us a great foothold in this important sector. Modern English have a long history working with the music industry. Their most recent work for EMI’s Now! Artist of 2016 poll received 21m public votes and over the years they have worked on projects for Stevie Wonder, Peter Gabriel, Madonna, Pink Floyd and Blur.